Maybe you've seen them on industry leaders websites and questioned how the hell they were able to create something so flawless? Maybe you thought to yourself, there's no way I could make anything like that? Maybe you questioned, what the hell would I make one about? Quizzes. I'm talking about quizzes here people. And luckily for you, I have the answers to all those questions above and will have you on the fast track to generating leads for your business while you sleep! If you are really struggling with nailing down your ideal client, quiz answers actually benefit you immensely by helping you to better understand what matters most to your best clients. What an easy way to learn more about your target market! Household names like Marie Forleo, Ashlyn Carter, and Jenna Kutcher are just three badass lady bosses that immediately come to mind when I think about who uses quizzes in their marketing strategy. Obviously, whatever they are doing is working!! Surprisingly, this is the easiest answer of them all. Instead of hiring a developer or trying to create a homemade app that resembles an epic Pinterest fail, use the most user-friendly and cost effective tool I've come across. That my friends, is Interact. (Yep, that’s an affiliate link. They’re good peoples, and I totally dig their product). I found Interact’s quiz software super easy to setup and incredible customer service. Well, luckily for you, my friend, I've provided a few suggestions of the kind of quizzes you could be creating! 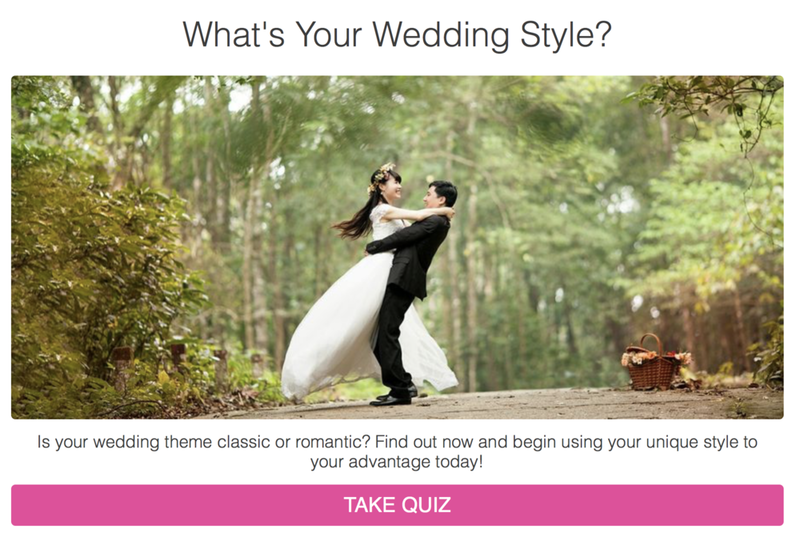 What type of wedding theme fits your personality? What bridal look reflects your personality? What type of flowers fit your personality? What design elements will reflect your wedding theme? What type of centerpieces should you go with? What type of ceremony decor fits your style? Which color combination best suits your family's personality? Quizzes aren't things industry professionals take advantage of very often. Highlight the quiz on social media and send an email to your list of subscribers! Looking to drum up new clients? Run a Facebook/Instagram ad campaign to your quiz! You want to make sure to really showcase it. I’m Lauren, your wedding business visionary! I educate wedding pros on the behind the scenes of their businesses through practical knowledge and intuitive strategy. I incorporate my intuitive gifts with solid business strategy to maximize my clients' progress and success. Let’s set up a time to chat! Let's Set Up a Time to Chat!